With our helpful gold wedding band buying guide, find out the basics of choosing this piece of jewelry. A wedding band is an important accessory. When you want an option that will last a lifetime while retaining beauty, check out our buyer's guide to gold wedding bands. One of the most important aspects to consider is the color. While most people think of yellow gold as the traditional wedding band option for men, there are other choices. Gold wedding bands are available in yellow, white, and rose gold. Yellow gold is popular when choosing a traditional look. It has a bright luster that is attractive and works well with other jewelry. White gold is made from yellow gold mixed with other alloys to create a stunning white luster. This color works well when dong a two-tone band or with diamonds. 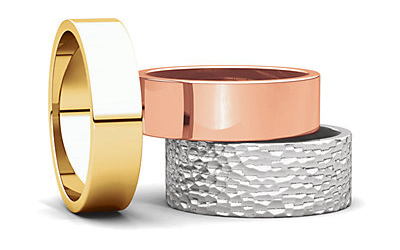 Rose gold is a newer option that is taking wedding jewelry by storm. It is created by combining yellow gold with copper to make a pinkish hue. It is a romantic and stylish color choice for this accessory. The next factor is the style. There are many styles to choose from. 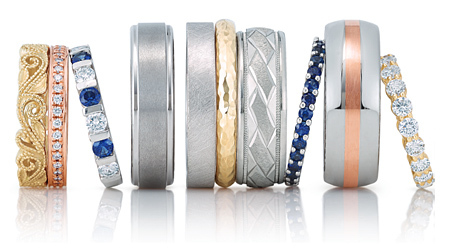 Whether you prefer a traditional look or a more modern take, there is a wedding band right for you. When choosing a more classic band, a simple polished yellow gold band with rounded edges is a great choice. For a more modern take on the classic gold band, consider an option that has been updated with details such as engravings, braided designs, special texture options, and more. One popular way to dress up the basic gold wedding band is with gemstones or diamonds. Diamonds work well with all colors of gold, but colored gemstones work best with white gold. White gold allows for more color to be reflected. There are several options for the fit of the wedding band. When choosing fit, you should examine the width as part of this factor. While some men prefer a thinner band because they want a lightweight fit, other men may prefer something thicker. A thicker band is ideal for individuals that work with their hands and want a heavier feel. Finger size and hand size will also play a role in finding the right fit in terms of width. For example, men with longer fingers should consider bands that are at least 6mm in width. If you have shorter fingers than average, we recommend a 4mm or 5mm wide ring. There are also options in fit such as comfort fit bands with rounded edges for added comfort for years to come. A good way to figure out the best choice is to try on several options to find the most comfortable, natural fit for your hand. A gold wedding band is a classic symbol of commitment. With these tips, make sure you get the right ring! Shop our gold wedding rings collection here.